Get yourself a piece of paper and jot down your top ten of bad career moves. We bet that Emerson Fittipaldi's decision to join his brother's Copersucar-backed operation for 1976 comes in as an odds-on favourite to take the number one spot. Talented Brazilian saloon racer Ingo Hoffmann was just one of the many victims made in the largely wasted years of the Fittipaldi F1 team. 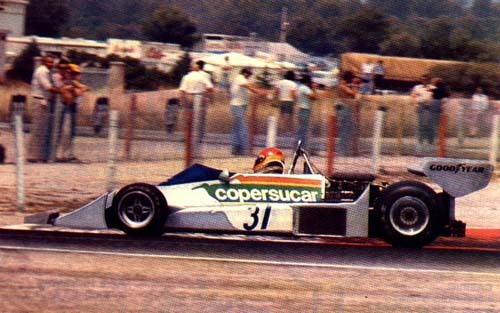 In 1975 the elder and less talented of the Fittipaldi brothers managed to sway Brazilian sugar conglomerate Copersucar into supporting his F1 project, which effectively was yet another kit-car project spurned by a driver who was passed over by the established teams. Having been Brabham's third driver in 1972 and 1973 Wilson Fittipaldi developed into nothing more than a steady midfield runner whose two-year campaign eventually rendered three World Championship points. 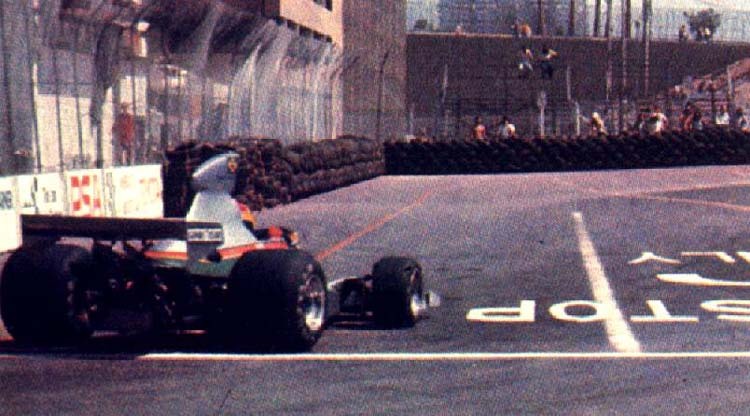 So while younger brother Emerson took his second title from the hands of Clay Regazzoni, Wilson started setting up his own Grand Prix team, which in 1975 took to the tracks. Wilson Fittipaldi and Brazil's best known designer Richard Divila started work as early in October 1973, Wilson just having left MRD. Presented as a Brazilian national effort about a year later, the Copersucar-Ford (as the Fittipaldi cars were known in their first years) incorporated many components supplied by national aircraft company Embraer and was of course backed by Copersucar. Moreover, Emerson acted as an external consultant in 1974 through 1975. Early 1975, at Buenos Aires, the team got off to a bad start. Wilson and his Copersucar FD01 (FD standing for Fittipaldi/Divila) qualified 23rd and last and crashed heavily on its debut race, destroying the tub. For their home race at Interlagos a new FD02 tub was hastily built up, while later in the year Wilson switched to the third FD03 chassis. As with Tyrrell in its early years, these first few designations (FD01, FD02, FD03) belonged to singular chassis and were effectively chassis numbers rather than type designations, although the cars frequently and radically changed form during their year of service (Hoffmann also made his 1976 debut in the FD03). The season was a disaster, Wilson bringing up the rear on each and every occasion, a lowly tenth in the season-closer at Watkins Glen the meagre reward for a year's hard work. Thus it came as a shock that double World Champion Emerson Fittipaldi would join the team from 1976 on. How would this team operating from far-away Brazil ever be able to upset the establishment, even with the mercurial talents of a still very young Emerson Fittipaldi? It probably couldn't, as both Wilson (stepping down to become team manager) and consultant-turned-driver Emerson realized, and so they decided to drop the see-through veil of a Brazilian national effort and move the team to Reading. On top of that, Divila's totally new FD04 design was even more of a Cosworth kit car than its predecessor. It must be said, the car looked good. It had a M23-style chisel nose, big windscreen and sharp lines all the way to the rear wing. One was built in Sao Paulo but the other two came from Reading, which made more sense with all the Cosworth and Hewland-related suppliers just around the corner. At Interlagos, it looked like the team had made the spectacular turnaround no one had expected, Emmo qualifying an astounding 5th. But apart from a 7th grid position at Monaco and a triplet of sixths nothing much was gained, and the car's Interlagos form had more to do with Emerson's home track knowledge and others not being entirely ready… Actually, the car only really started to work in its second year of service, Fittipaldi racking up two fourths and a fifth early in the season before the F5, a Dave Baldwin-penned Ensign N175-lookalike, came as its replacement. Also in 1976, a second car arrived for Brazilian Super Vee and saloon racer Ingo Hoffmann, who had come to Britain the year before to take part in F3. Too inexperienced at this single-seater level, the tin-top star suffered from all the team's resources going into Emerson's car. Having qualified for his home race in the old FD03 he continued with a string of three DNQs in the new car (the first one at the inaugural Long Beach event is our picture, while Ingo's brief and unsuccessful return at Paul Ricard is pictured here) before the team put him out of his misery and wisely decided to concentrate on one car. They tried again at the start of 1977, promising a full-season ride to Ingo, but this time the Fittipaldis pulled the plug on the second car after just two races. Poor Hoffmann then had to retreat to F2, signing up with Ron Dennis' Project Four outfit, becoming a star of the 1978 championship. After that, Ingo returned to his native country and his first love - tin-tops. For two decades Hoffmann has been the undisputed king of Brazilian stock cars, winning the championship a massive eleven times (including an unprecendented six-year title streak between 1989 and 1994, before claiming another triplet between 1996 and 1998! ), with more than 40 wins to his name. The nineties saw short forays into GT and touring car endurance racing, driving alongside Nelson Piquet in BMW M3s, before becoming one of BMW's main men in the new SudAm Super Touring Championship. In the two years the series was at its peak, Ingo helped another F1 reject, Oscar Larrauri, to two consecutive titles. With interest in Super Touring waning, Hoffmann went back to the Brazilian stock car series in which he is a front-runner once more, trying to take his 12th title from the hands of friend and fellow Fittipaldi victim Chico Serra. Meanwhile, Copersucar Fittipaldi's fortunes were still waiting to turn. With Dave Baldwin leaving before the F5 had even turned a wheel, performance soon dropped to embarrassing levels as Emerson failed to qualify at the high-speed tracks of Hockenheim and Monza. The car suffered from a lack of straight-line speed, which combined with unpredictable handling characteristics is not the thing you want when approaching the Stadium or the Parabolica. For 1978 Wilson and Emerson turned to Giacomo Caliri's Fly Studio to convert the F5 into a ground-effect car, the F5A, with a new suspension lay-out and Lotus-style sidepods its main new features. As it turned out the later Minardi designer created Fittipaldi's most successful car ever, Emerson hauling the thing into an astonishing second place in Brazil and racking up some good points finishes later in the season. It enticed ex-Brabham and ex-McLaren designer Ralph Bellamy to join Fittipaldi but for 1979 he then managed to produce an absolute failure of a car. What was supposed to have been the final jump to the top was turned into a downward slide the team never recovered from. With the F6 proving a dud on its Kyalami debut, Fittipaldi had to rely on the ageing F5A to do the job, and while its form had been encouraging during the 1978 season, it was less-than-average a year later. (Incidentally, with the F6 returning the cars immediately passed hands to Guy Edwards's Aurora team while Colin Bennett reworked one of those to F5B spec for the 1980 series in which it was raced by Val Musetti.) As late as Hockenheim an updated F6 finally appeared but its ground-effect problems didn't look like being solved. So the best looking Fittipaldi ever will also go down as the worst performing one, compared to the high expectations. For 1980, the Fittipaldis started all over again. First they bought the remains of Walter Wolf's defunct outfit, which also included its WR7 and WR8 cars, designer Harvey Postlethwaite and driver Keke Rosberg. Second, the Copersucar backing was replaced by that of Skol Brasil. And with Rosberg on board it was decided to form a two-car team again, swapping the number 14 for numbers 20 and 21. The revised Wolf cars were used as F7s during the first part of the season (which gained a third place each for Fittipaldi and Rosberg) while Postlethwaite was busy with the F8, which understandably would follow Wolf lines. But sadly, after the Bellamy debacle another famous designer delivered a less-than-inspired design to Fittipaldi, as the new car was substantially low on performance compared to the revamped Wolfs. Rosberg's fifth place at Monza was its only result. As Emerson Fittipaldi announced his retirement from F1, taking up the team's management, the last two seasons of the Fittipaldi team became even more of a disgrace to his name, the outfit running the outclassed F8 in various guises and the single Divila/Wright-penned F9 (which appeared in France '82) to a budget gathered from a truck load of tiny sponsorship contracts - which became visible in the dreadful livery of the car in their swansong season. Indeed, the team's only claim to fame from those two wasted years comes from being the stupid-looking part in a striking record-book entry: that of Keke Rosberg being the only World Champion to have become so after failing to score a single point the season before. That he did driving a Fittipaldi F8C. In 1972, Ingo Otto Hoffmann (Ingo Hoffmann), bought a "Fuscão" 1600cc (Volkswagen model car). Ingo was 19 (he was born on 28/02/1953) and he started to run with this car in the Festival do Ronco (Snore´s Festival). This category was the Division 1 (in Brazil) and he competed against the Brazilians drivers Júlio Caio and Teleco. He did three races in Interlagos finishing in fourth, fifth and seventh places. Then the engine of the Fuscão gave up. Ingo had no money to buy another engine, so a friend loaned a car to travel to Curitiba for the next three races. He travelled secretly from his parents! Ingo said: "I remember I finished in 2nd place in the first race, but I would have won if I had not stopped to wait for another driver to come back into the race after he had spun..." Then Ingo came back home and after his parents had seen the prize for 2nd place, they encouraged him to race. In the second race he won and in the third his engine again blew. In December 1972 the Brazilian motor preparator Giba transformed Ingo's Fuscão to Division 3 category. In this category Ingo took a win and a 2nd place but he did not finish the four other races. He had the title PC (Competition Driver) and won the race in Interlagos after a good battle with Alfredo Guaraná. His father, Dustin Hoffmann (! ), was working in the Creditum Group and after these races he got a big Creditum sponsorship for his son. Ingo was the champion in Division 3 in 1973 beating Ney Faustini, Fausto Dabbur, Edson Yoshikuma, Alfredo Guaraná, Alex Dias Ribeiro, Julio Caio A. Marques, Roberto Fanucchi and Sá Carvalho. In Division 1, Ingo and Alex Dias Ribeiro were third on the Brazilian 1000 Miles grid, but a brake problem took away their chance of a win. He then won the Paulista Division 3 championship and joined his friend Giba exclusively to prepare the Brasilia car for Division 3. The car had a Hewland F1 clutch and was adapted by Ricardo Divila. The wheels were narrower to win in top speed. Ingo started his Brasilia in the third championship race. He had problems in qualifying (high temperature) and in the race but made the fastest lap, led on the last lap, but spun off at Interlagos curve 3. In Formula Super Vê (another Brazilian championship category) the chassis were Polar (with Nelson Piquet and Marcos Troncon), Heve and Kaimann (with Ingo Hoffmann). His Kaimann was prepared by Giba (engine), Wilson Fittipaldi (suspension) and Ricardo Divila. The partnership of Wilson-Ingo-Reinaldo Campello won the 1974 Souza Cruz 25 Hours (Division 1 - C class) with a Opala Chevrolet 4100cc. After this race, Ingo and Wilson became good friends. In Formula Super Vê, Ingo lost the 1974 championship for Marcos Troncon in the last race, when he abandoned with an engine problem. Now he was considered the best driver in Brazil, after two Division 3 championships (with Fuscão and Brasilia). He and his father had founded a firm "Ingo Hoffmann Sports Promotion". In 1975 he went to Europe to race Formula 3 with a private March 753 with a Toyota Novamotor engine. His chief was Clive Santo and the mechanic was Ken Taylor. His car was totally white because he didn't have any sponsor but Ingo won one race (at Oulton Park) after having taken pole and the fastest lap. He finished the British Championship in 6th place with 34 points against the 74 of champion Gunnar Nilsson. On 28 September 1975, he started in F5000 at Silverstone with a Chevron of T.Dean Team. He took 7th place. He ran in two more F5000 races: Mallory Park (retired) and Brands Hatch (4th place after he had started from last on the grid). In 1976 he was in F1 with the second Fittipaldi car. He finished the Brazilian GP in 11th place while Emerson, the team's first driver, took 13th place. In his second F1 race, at Long Beach, he failed to qualify. Michele Leclere, Arturo Merzario, Bob Evans, Jacky Ickx, Harald Ertl and Brett Lunger didn't as well. In this race, Emerson Fittipaldi finished 6th, giving the first point to the Fittipaldi team. Ingo had two more goes in F1 in 1976 but did not qualify in Spain and France. Then, in F2, his best result was 5th at Thruxton with a March 762-Ford. He finished the championship with 3 points driving for Willy Kauhsen's team. In 1977 he raced twice in F1 (both for the Fittipaldi team), in the Argentine and Brazilian GPs. The engine failed in Argentina and in Brazil he was lying in 6th when he had a puncture, causing him to finish 7th. This was his last F1 race. In F2, he was driving for Project Four with a Ralt RT1 (the Ron Dennis team). His sponsors were Bitter Safari and Jota's. His partner was Eddie Cheever. Ingo finished the championship in 7th place (18 points) joint with Alberto Colombo. He had his worst accident in Estoril with Riccardo Patrese. They weren't injured, but the cars were severely damaged. After that the locals renamed the corner Hoffmann's curve. In 1978 he stayed with Project Four, with Eddie Cheever again as his team mate, now driving a March 782-BMW. He won the race in Argentina and in European F2 he finished in 7th place, together with Piero Necchi, on 13 points. In 1979 he returned to Brazil and started in stock cars. Since then he has never stopped running in it. Today, he has 11 championships in stock cars, two in Formula Fiat-Uno, 2 in Brazilian Marc, one in Argentine F2, and two in Division 3. Ingo also won in Brno with a Czech Touring Car Championship BMW 318. Since 1998 he also ran SudAm Superturismo. He finished the championship in 3rd, behind Oscar Larrauri and Caca Bueno, and in 1999 trailed Emilio Spataro and Caca Bueno. Today he continues in stock cars, with over 50 wins and 50 poles to his name. In his career, Ingo took more than 90 wins and has been a good businessman. He had four tyre shops (Automotive Centers) selling Michelin and Nakata products. He is married to Ruth and has 3 children: Nina (20), Ligia (17) and Robert (12). In the 2000 Stock Car series, Ingo is once more disputing the title with his friend Chico Serra.